So, what does that leave for Part 4? Plenty! 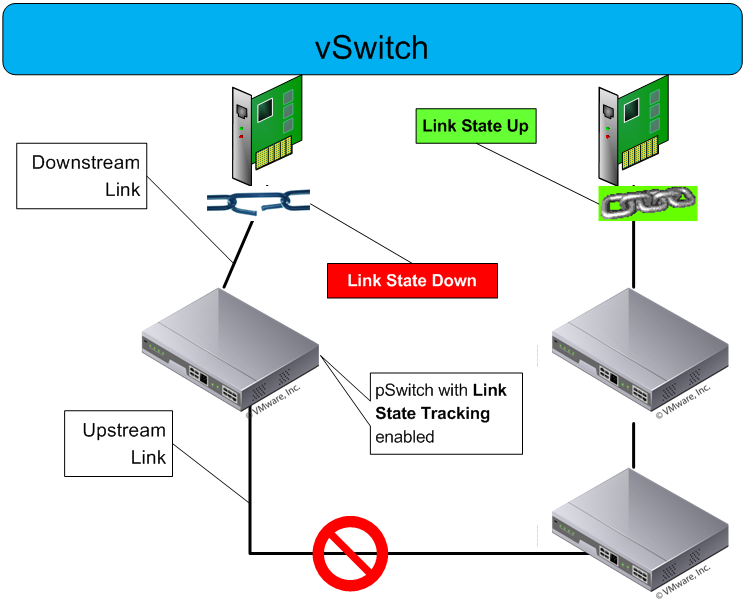 In this edition, we’re going to talk about how a vSwitch detects path failures and also dip our toes into the Cisco Discovery Protocol waters. Now, on to the next topic! OK, so we’ve moved the responsibility for fault tolerance from the virtual machine’s guest OS and placed it squarely on the vSwitch. This begs the question – how does a vSwitch know that a failure has occurred, and what does it do about it? Well, let’s see if we can answer those questions! ESX supports two types of network failure detection mechanisms, beaconing and link state detection. Let’s investigate beaconing first. Beacon Probing, frequently called simply “beaconing”. Beaconing is intended for use in situations where there are multiple pSwitches between the various pNICs pNICs in a vSwitch. Beaconing is a technique that sends layer two Ethernet broadcast packets from every pNIC in the team to every VLAN to which the vSwitch belongs (yes, that means that if your vSwitch participates in 10 VLANs, beaconing will transmit 10 broadcast packets per pNIC per beacon interval! ), although you do have the option of overriding the vSwitch default settings at the Port Group level, if you desire. See Figure 1 for a depiction of a single pNIC transmitting beacon packets to the broadcast address (in normal operation, every pNIC will transmit beacon packets on every connected VLAN). This packet would be received by all other pNICs in the broadcast domain. An interesting note is that this is the only situation when, during normal operation, you will see the MAC address of the pNIC on the network. The MAC address or the Beacon Initiator pNIC is used as the source MAC address in the beacon frame. 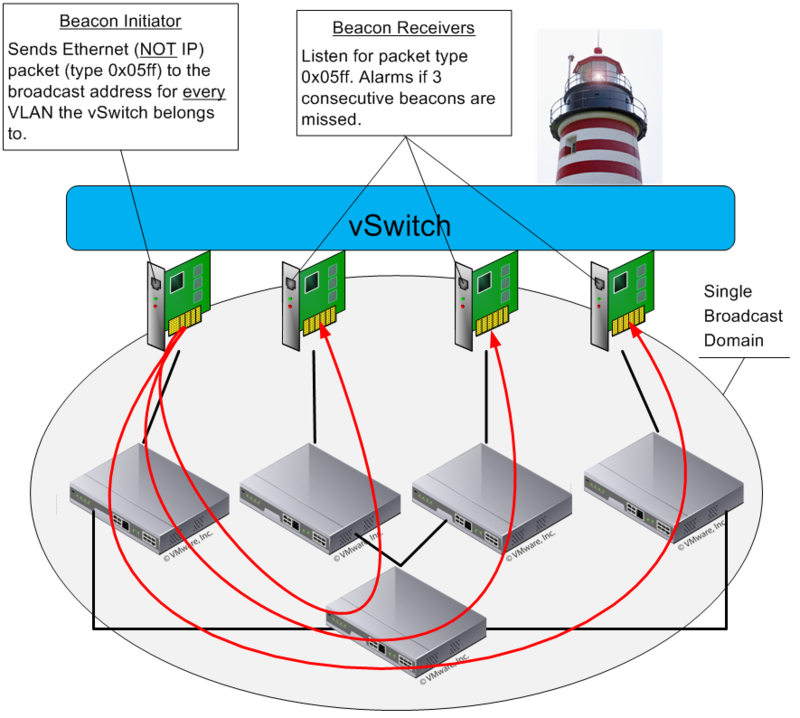 It is also of interest that the vSwitch will absorb the beacon frames received by the Beacon Receivers – the virtual machines will never see the beacon frames. If two or more uplinks receive beacons from each other, those uplinks are considered good. We stop using uplinks which do not receive any beacon packets. On ESX 3.5, if no uplink receives beacon packets, traffic is sent to all uplinks (shotgun mode). If a team has two uplinks, any link failure will result in all packets being sent to both uplinks. As you see, you can wind up in a situation where you are transmitting all packets along every uplink path. This can cause extreme confusion for your pSwitches, especially if you have multiple uplinks connected to the same pSwitch (not recommended when using beaconing)! Basically, Beacon Probing should not be used as an alternative to a robust Layer Two network implementation. Instead, use Link Status Only as your network failure detection mechanism. Link Status Only error detection relies upon the pNIC’s link state detection capabilities to identify when there is a problem with the network path. At first blush, you may think this is not a very robust error detection scheme – it only sees the condition of the connection between the pNIC and the first upstream pSwitch! It also does nothing to verify that the pSwitch port is configured correctly, and it can’t see deeper into the network. While all this is true, there are some things that can be done to help alleviate these problems. Please post part 5, I’m on the edge of my chair! Your vSwitch article is excellent, and explains a lot of information in a small space that is very useful to me (and I’m sure many others). Keep up the good work! Interesting, indeed. If I click on the link, it goes to your URL, but brings up abundantbible.com & if I view source, the HTML is correct…the href points to you, too — perhaps someone has hijacked your DNS entry? Also, don’t use beacon probing when you only have 2 nics… there’s no way of detecting which nic failed with only two. One thing to note is that, while link state tracking does work for some scenarios, if you have a glitch (as we have done) where a host pNIC simply stops passing traffic, any VMs on this pNIC will die and remain dead until you manually intervene. Likewise, if your helpful switch admin makes an error in the VLAN config on the switch and (for example) deletes a couple of VLANs from a single port, again this will result in an extended outage for your VMs. We are also considering beaconing for the same reasons Daern mentions. Specifically, we have had various flaky nic driver issues where link state is ‘up’ but the nic fails to pass traffic. I would be curious to hear from Daern now over a year later to see where you sit on the issue now. (are you still using beaconing). Also, did you ever find an ‘elegant’ way to ‘detect’ when a beacon failure occurs? especially in a 2 pNIC situation. We have had some occasions when “link-state” wasn’t enough so i’m looking into beaconing now. Will this only occur on vlan 4095 ? Cause if not, im considering to enable beaconing but setting the interval to a much larger amount, so we won’t be flooding the physical switches. Yes, it is only with VLAN 4095, which allows the associated port group to see all packets. You should write a blog post about your experience with “link-state” not meeting your needs – especially if you were using link state tracking!